Faculty, staff and students now have access to Passport. Passport is Euromonitor International’s global market analysis software platform and provides industry analysis in countries around the world. The database includes a market size and market share database for all products across key countries. Passport can be accessed from the Business Library website’s Databases A-Z list: Please note that on campus and off campus users will be required to enter in a HawkID and password to access Passport. If you have any questions, please contact a business library staff member. World Market Intelligence is a live business information platform exclusively designed to support and enhance research projects conducted by the academia. Coverage spans various industries including pharmaceuticals and medical devices, financial services, construction, IT, etc., sourced from some of the world’s most respected business information and media brands: Timetric, Canadean, Kable, Strategic Defence Intelligence and GlobalData. Note: From the homepage, use the LOGIN button. 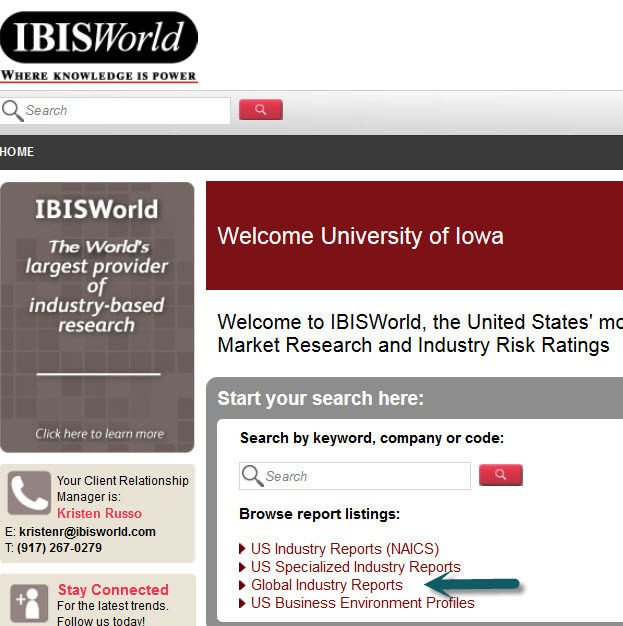 We now have access to Global Industry Reports in IBISWorld. The Global Industry component of IBISWorld offers analysis and forecasts on 75 global markets. The regions covered include Africa, Europe and the Middle East. To browse the reports click on the link on the IBISWorld homepage. Changes have been made to our Harvard Business Review access through the EBSCO Business Source Complete database. Harvard Business Publishing has changed the license agreement to make 500 selected Harvard Business Review articles “read-only” in Business Source Complete— the articles cannot be linked to, printed, or downloaded. This change will affect all university customers. The 500 selected articles are composed of what Harvard considers popular or classic business articles. You and your students will still be able to locate these articles in Business Source Complete but you will be limited to reading them online. If your students require personal paper or electronic copies of these articles as part of your course readings, you will need to include these articles in your print or electronic course packs. If you find you need a copy of one of these articles for your personal use, Pomerantz Business Library staff will be happy to deliver it to you via our document delivery services. If you have any questions pertaining to University of Iowa HBR access, please contact the Biz Lib. Are you Mad for Mad Men? Explore the world of Mad Men through collections from the U. of Iowa Pomerantz Business Library and Special Collections & University Archive. Online exhibit can viewed on Pinterest. The Financial Times Historical Archive delivers the complete searchable run of the world’s most authoritative daily business newspaper. Every item ever printed in the paper, from 1888-2006, can be searched and browsed by article and page by page. It includes over 700,000 pages of past issues for the stated period of coverage, including Special Supplements and the FT Magazine. The first numbers from the 2010 Census will be announced today and two cool links reflecting new numbers have been added to http://guides.lib.uiowa.edu/census. One is an interactive map for population change and the second is a snappy littleYouTube video explaining Apportionment. Iowa is one of the many states that will lose a seat or two in the U.S. House of Representatives due to application of the apportionment formula. The 2010 Iowa City Book Festival (ICBF), presented by the University of Iowa Libraries, has announced its schedule for the three-day celebration of reading, writing and books July 16-18. The Festival offers activities for the entire family: best-selling authors, hands-on book arts, kids’ activities, music and festival food.